the neighbours surprising them with a "Shivaree", which was a new custom to her, and presenting them with a lovely rocking chair and providing a bounteous lunch. 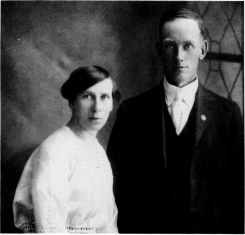 Jack and Hannah had two children, Margaret and Jack. My brother and I have many happy memories of our childhood on the farm, clearing the ice to skate in winter and taking out the rowboat in the summer. A family of loons nested off the northwest shore of the lake every year and the cry of a loon can still take us back in memory. We were two miles north of Danvers School and usually walked, though for a time we both rode old Scottie half way and then turned him back; he would head smartly home. This lasted until he discovered, and began making detours into, Nels Noto's haystacks. Our dad also built us a one-horse toboggan with a brake on one side which dug into the snow when pulled and was designed to stop the toboggan from running into the horse's heels. We took many tumbles into the snow on the corners. We had a Maxwell touring car and in 1928 dad kept a record of costs; he bought a tire for $7., a new radiator for $12., fan belt $1., and paid 70 cents for two gallons of gas. The car was put up on blocks during the depression and we travelled by cutter, buggy and horseback. Times were hard and everyone worked long hours fighting the drought, hail and grasshoppers, but on the farms at least we were not hungry. Neighbours found time to visit and to help each other in times of need. Mother belonged to the Whirlpool Ladies' Aid, a busy group. There were picnics, with races for the children; the men played horseshoes and the ladies provided homemade ice-cream. At the school concert they also provided a gift for each child on the Christmas tree. Following the concert the adults would dance, having stacked the desks along the walls. In these desks small children would sleep, wrapped in coats and blankets, their lullaby a square dance caller. No baby-sitters in those days! The teams outside would stomp their feet and listen to the music. I can still hear, in memory, the sleigh runners squeaking in the frosty snow and the horse bells ringing as the cold horses headed for their warm home stables, their drivers see-sawing on the reins trying to keep them to a slow gallop. Possibly because of his English heritage our dad started one of the first flocks of sheep in the area. In­ variably there were early lambs born during a spring storm, to be nursed in boxes around the kitchen stove. I can remember my mother valiantly striving to save those small, wooly animals, many times staying up well into the night. Another memory of those times, I cannot recall which year, there was a potato crop failure. Beans were sub­ stituted and served in our home, always with molasses. To this day I love, and will not eat, beans without a generous covering of molasses. Hannah and John Wilkinson - 1921.
this meal to her brown bread. Dad had a Reference and memoranda book put out by the Royal Bank at that time. There were slogans printed at the top of each page. Under one read - "the road from the farm to the banks should be well-worn". In 1929 he had pencilled "but it is not". On Sundays my brother and I walked to Sunday School held in Whirlpool school; later we were confirmed in Danvers Church. Our father died in 1938 and rests in Danvers Cemetery. After Jack's death, Hannah, with her children, returned to Ponteland, England, to her family, in May of 1939 just before the outbreak of the Second World War. During the war Margaret trained as a registered nurse. In 1946 she married Bob Cookson of Low Fell, County Durham, on his demobilization from the British Royal Engineers. They have two sons and the family moved to Oakville, Ontario, in June, 1955. Hannah also returned to Canada in the fall of that year. Jack and his wife, Eleanor Atkinson of Newcastle, Northumberland, were the first to return to Canada with their small daughter in the spring of 1952. Two more daughters were born in Oakville. Now the Wilkinson family were together again. Margaret and Jack each have five grandchildren. Jack inherited his father's love of horses and farms near Shelburne, Ontario where he breeds and trains Quarter horses. Mother lived until 1974, flying back to England twice to visit nieces and old friends. Following her death, we brought her ashes to Danvers.